Earlier today, Capcom held a livestream about the upcoming Deviljho update for Monster Hunter World. This update has been teased for a while, but we finally have a definitive release date as to when it will launch, and what it will feature. The Monster Hunter World Deviljho update is coming March 22, and it will feature a new monster in Deviljho, new weapons and armor, and a new Spring Blossom event. Update: The Spring/Deviljho update is now online. See our guide to fighting Deviljho here. Deviljho will be the first new monster to hit Monster Hunter World since the games January launch. Fans of older Monster Hunter games will immediately be familiar with this monster, as it has appeared in previous games. For those of you new to the series, Deviljho is of the Brute Wyvern species and looks kind of like a cross between an eel and a Trex. From a gameplay perspective, Deviljho acts in a similar manner to Bazelgeuse in that it will randomly show up during hunts of other monsters to make your life more difficult. Officially, Deviljho invasions occur in 6* and 7* quests, and high rank expeditions after you’ve completed the “??? Rathinan” investigation during the main story. There is a special assignment for Deviljho which will become available after completing certain conditions. Since there’s a new monster being released, there are also a couple of new armor sets available for players to earn. 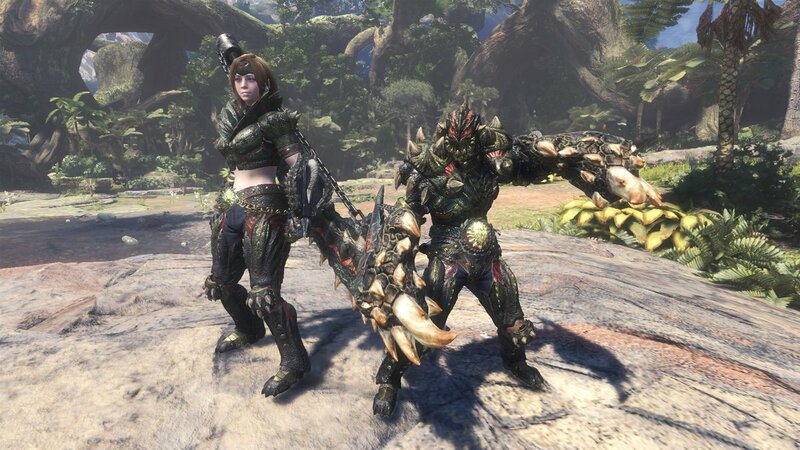 Called the Vangis/Greed set, the new High Rank armors (α+β Sets) will be available for both female and male hunters. There’s been no word yet on the special abilities and attributes of the set, and I assume we won’t get any until the update drops. From an aesthetic standpoint, the female set definitely got the short end of the stick here. The male set on the other hand looks pretty badass. 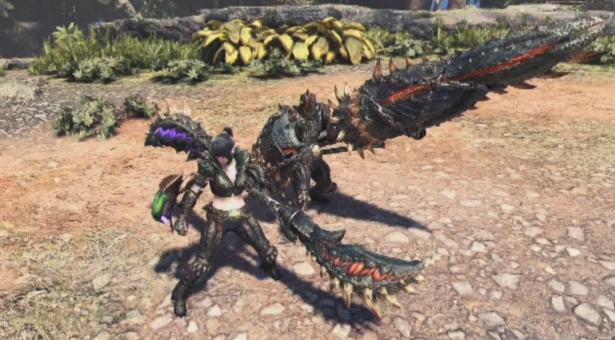 The stream didn’t show off a ton about the weapons you will be able to craft from the Deviljho materials, but we did get to see a couple of them. 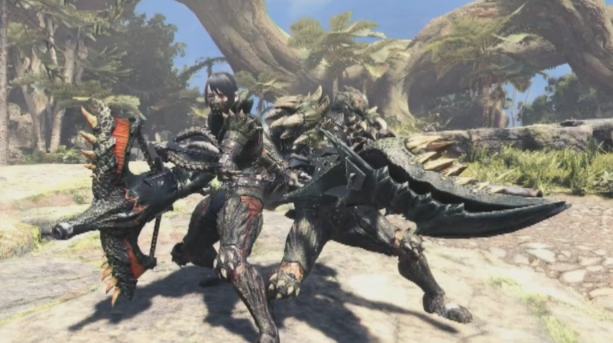 Weapons shown during the livestream included the Gunbow, Insect Glaive and Lance. On the melee side of things we learned they can have white sharpness with handicraft. Optimized data processing to reduce load times. Added “Return to Gathering Hub” (single player) and “Disband & Return to Gathering Hub” (multiplayer) to the options for ” Select Return Destination” after a quest. Attacks fro allies no longer interrupt you during the carving animation. Additionally, players are now immune to all hit reactions, including bombs, during carving animations after quest completion. Changes the visual look of the Gathering Hall. Previously released event quests will once again be available. Lucky Voucher increased to two per login bonus. New gestures coming (lots of dancing). Winner of contest was a greatsword that features a more futuristic look. Features a number of thrusters on the back of the blade which activate when charging attacks. The weapon was shown with white sharpness. Megaman arena quest featuring two Odogaron. One of the Odogaron is very small. Quest completion will earn materials that lets you to make a Megaman weapon and Megaman Full Armor Set for your Palico. What did you think of the Monster Hunter Deviljho update livestream? Like what you see coming down the pipe for Monster Hunter World? Let me know your thoughts in The Pit below. More: Monster Hunter World news, updates and guides.